Are thank-you notes outdated? Not in the least, and if you don't send one, you're hurting your chances of closing the deal and securing the job. Why is that the case? And should you send an email or hard copy? Let's break it down. Most importantly, you want to demonstrate that you appreciate the interviewer's time, and it's considered polite to tell them that since they made room in their day to see you rather than someone else. If you want to be a little more self-centered about it, consider that the note can actually affect your prospects. If you are an absolutely perfect candidate, lack of a note might be overlooked, but how many applicants are actually a perfect match. And some hiring managers say it is practically required to move to the next stage. 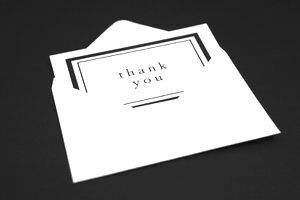 According to a CareerBuilder survey, 89% say it's acceptable to send a thank-you note by email. Snail mail obviously takes much longer and it can get buried. But depending on the atmosphere and the sense you get from the hiring manager, a more formal written note can be appropriate and may even help you stand out. Handwritten letters on beautiful paper with lovely penmanship are coming back into vogue, so take advantage of the trend! Also, investigate Paperless Post which is a happy medium—beautiful stationery with your personalized message sent via email. Don't just dash off a quick letter. Take your time and choose your words thoughtfully. Be personal, authentic and write a memorable message. Think back to your interview and draw on what you spoke about. Was there a funny moment you can recapture? An inside joke? Then go a step further and reiterate why you'd be a good match and the skills you bring. You might also want to introduce a new topic—mention some additional thoughts you had after the interview, points you'd like to discuss further and ideas you have to share which opens the door to scheduling another meeting. The overall goal is to make an impact. Thank you so much for taking the time to interview me today for the System Administrator position. I felt a wonderful rapport with all of the team members I met with and I hope I convinced you that I will fit in well as a member of the team and will quickly be able to contribute to the company. I was thinking further about the database merger you plan to undertake and have some specific ideas on how I can assist in making that a seamless process. I look forward to sharing my thoughts in a future meeting. Again, I very much appreciate you taking so much time to talk with me and I am tremendously excited about this opportunity.